Matlock boss Mark Atkins (left) will be anxiously waiting news on the fitness of a clutch of key players ahead of two games against potential title winners this week. On Saturday, the Gladiators travel to second placed AFC Fylde, who have banged in eleven goals in their last two games, before fourth in the table Chorley come to the Reynolds Stadium on Tuesday night (10th). Atkins is highly satisfied with four points from visits to Blyth Spartans last weekend and Ashton United on Wednesday night to leave his side in ninth spot, but with a small squad, the injuries are a worry. They travelled to the north east last week already without James Lukic, last season's Fans Player of the Year Adam Yates, Lee Featherstone, Anton Foster and Anthony Griffiths-Junior but then in the pre-match warm up, Micky Harcourt damaged a hamstring, followed in the game by top scorer Darryl Thomas and captain Liam Needham being forced off through injury and Joe Leesley hobbling through the final minutes. It left Town with just nine fit players - after the bizarre sending off of Gareth Davies - who had stepped into Harcourt's shoes at right back. Leesley recovered to play at Ashton and Griffiths-Junior was on the bench, but that was it - and more problems piled up as Corey Gregory and Oscar Radford were added to the injury list. 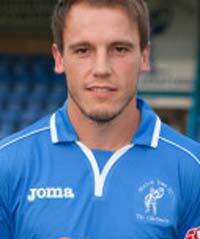 Matlock have brought in former Chesterfield and Alfreton boss - and qualified physio - Dave Rushbury to help treat their wounded players and he will be ultra-busy tonight (Thursday), as he treats and assesses the extent of what is rapidly turning into an injury crisis for the Gladiators. 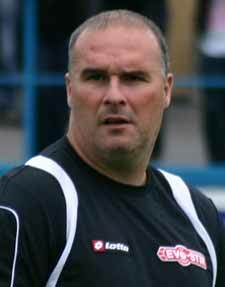 "A lot have to be rated very doubtful for the weekend" said Atkins after the scoreless draw at Ashton. "All of the injured lads will be seeing Dave Rushbury on Thursday and it's a matter of taking things from there. We'll then have to decide what to do from there." The 2-1 win at Blyth last Saturday was Matlock's first in ten league and cup meetings with the Spartans and it was certainly eventful, meaning that Atkins' men had to do it the hard way. Danny Holland's (left) first goal since arriving back after a ten year absence, gave the visitors a 15th minute lead, which was doubled on 52 when Gregory latched on to a Holland assist, shortly after Lewis McMahon had a goal disallowed. But Joe Kendrick halved the deficit scoring from the rebound after his penalty was parried by Jon Kennedy on 63 and Blyth suddenly sparked to life. "We were excellent and fully deserved the three points, it's a difficult place to go, but in the circumstances, with nine fit players on near the end, the lads deserve the utmost credit. "Everything seemed to go against us, we had the three onfield injuries to deal with after losing Micky (Harcourt) and then some unfathomable refereeing decisions. Lewis' goal looked a perfectly good one, the penalty, well that was very dubious and the decision to send off Gareth Davies was ridiculous. "Then the eight minutes of added time at the end. The penalty turned the game, Blyth certainly got some help but I'm very proud of each and every one of our players, who were magnificent. A mention too for our fans who travelled up there. Their support was great and really appreciated by the players and staff." Atkins thinks Holland's first goal will do him the world of good, "I'm really pleased for him, he's been excellent in the way he's led the line and used his experience to encourage the younger players, he's been great in the changing room. Not scoring before now hasn't really been an issue for him or us but every striker likes to find the net and we hope it's the first of many for him." Meanwhile, a troublesome blood clot behind a leg muscle continues to keep Adam Yates out, although he did travel to Ashton and did some exercises before kick off. At Ashton, Atkins felt the result was fair, "Over the ninety minutes, it was an even game, neither side did enough to win. We had a couple of players carrying injuries and we looked leggy and tired after Saturday but we're pleased with the point, even considering the Ashton player's sending off, as again, we had nine fit players with the injuries to Corey and Oscar." Matlock now know their FA Cup First Qualifying Round opponents next weekend. They will travel to Toolstation NCEL Premier Division new boys Basford United who beat Quorn after extra time and penalties in Tuesday night's Preliminary Round replay in Leicestershire. The sides drew 1-1 after 120 minutes after a 2-2 scoreline in Nottingham last weekend when former Matlock striker T J Nightingale scored in the 88th minute to earn Basford a second bite of the cherry.